Climbing up the hillside from the waterfront, the maze of shopping streets known as “The Lanes” make up Brighton’s most atmospheric quarter. 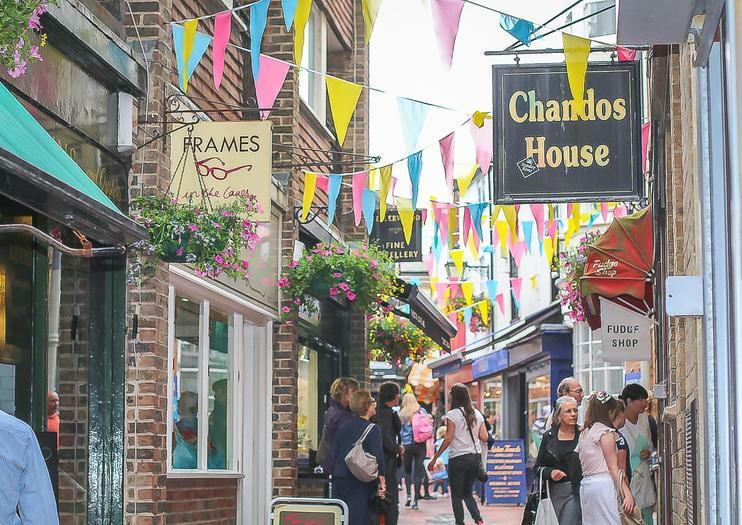 The pedestrianized area is home to more than 200 independent shops, galleries, and antique stores, along with a great selection of cafés, restaurants, and historic pubs. The only way to explore The Lanes is on foot, and with the lanes sloping down to the seafront, it’s impossible to get lost. Opting to visit with a tour guide will give you an insight into the historic quarter, its street art scene, and thriving LGBTQ community. A Lanes walking tour typically includes nearby attractions, such as the Royal Pavilion, Brighton Museum, and Brighton Pier. Most shops and cafés are open daily, with reduced opening hours on Sundays. Wear comfortable shoes to tackle Brighton’s steep hills and cobblestone lanes. Free Wi-Fi hot spots are located around The Lanes. Brighton's Lanes are located at the heart of Old Town just south of North Laine. Trains from London and other destinations arrive at Brighton train station, an around 5-minute walk from The Lanes. The Lanes are busiest in July and August, when smaller shops and cafés can get crowded. For quieter shopping, visit on a weekday outside of peak season, or join locals for a Sunday brunch at one of the cafés. Dating back to the 18th century, the narrow streets of The Lanes were once home to hundreds of fishermen's cottages, and their quirky, overhanging roofs were purpose-built to shelter the lanes from the coastal storms. Today, The Lanes retain much of their original character, with their old-fashioned shop fronts, brick-paved streets, flower-filled window boxes, and labyrinth of hidden passageways, known locally as “twittens.” Notable buildings include the Cricketers Arms, Brighton’s oldest pub, which dates back to 1545. Embark on a 1.5-hour walking tour of Brighton’s atmospheric Lanes – a maze of historic alleyways and ‘twitters’ (narrow passageways) at the heart of the Old Town. Along the way, hear stories of Brighton’s fascinating history from your local guide; get the inside scoop on the town’s coolest shops, bars and cafés; and see landmarks like the Regency ballrooms. Discover one of England’s most famous seaside resorts on this full-day tour of Brighton from Oxford. Walk along Brighton Pier and admire attractions such as the Royal Pavilion on a guided walking tour, then enjoy free time to visit Brighton Museum, browse the shops of The Lanes, or stroll along the beach. Discover two highlights of England’s south coast on this full-day tour from Bournemouth. Don’t worry about the logistics: round-trip transportation from the city center makes travel simple. Begin in Portsmouth, where you’ll go on a walking tour and will learn more about the city’s naval history, before continuing to buzzing, bohemian Brighton. After a guided tour of its major attractions, you’ll have free time to shop, head to the beach, and more. Your expert guide will take you on a 10 hour tour to the beautiful seaside British City of Brighton and help you explore this famous UK wonder. You will enjoy free 4G WIFI, phone chargers for all makes of phones to use all day inside the luxury touring vehicle. You will be provided with free water to enjoy inside the vehicle also. You will even get to stop at a secret place along the way to ensure you really do get that WOW factor! Your guide will know all the best places to stop so you can explore, shop and eat and where to get that perfect photo and will even take them for you to make sure all of your group is in the photo together.